This post is brought to you in partnership with Dixie Vodka. As always, all opinions are my own. Strawberry season is upon us! Because I try to buy produce as locally and seasonally as possible, I generally track the seasons based on food rather than a calendar. To me, strawberries are the essence of late spring when it’s warm, everything is verdant, and we start eating al fresco again. They’re also harbingers of summer–the first berries to appear at market before the onslaught of summer fruits. Speaking of summer, the season of fruity cocktails is also here! 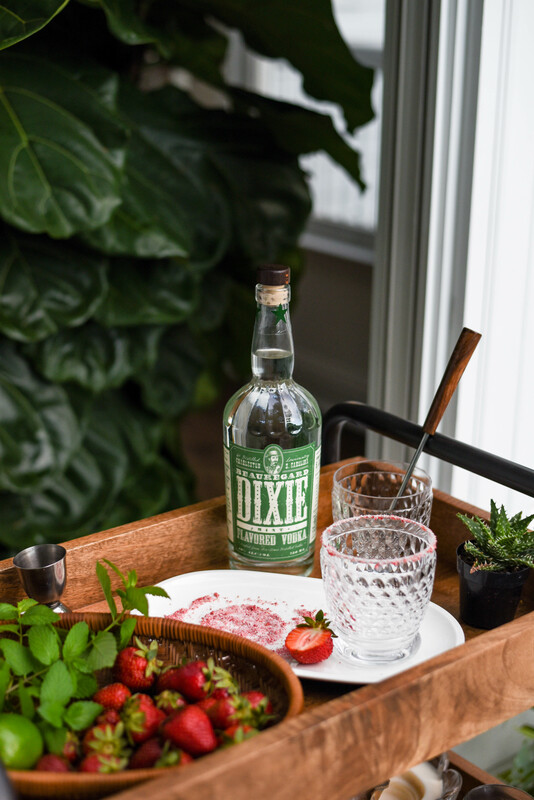 I got together with my friend Jess (aka Lady Flashback) and whipped up some strawberry-themed cocktails on her adorable sun porch with freshly picked King of Crops berries and Charleston-based Dixie Vodka. I was excited to collaborate with Dixie because many aspects of their brand are so thoughtful. Not only is it distilled (6 times!) and bottled nearby in South Carolina, but they also source all of their packaging materials in the Southeast. And this all-American vodka is made from non-GMO corn, which means that it’s a gluten-free product. First up is a strawberry + mint cocktail that I like to think of as a cousin to a strawberry mojito. 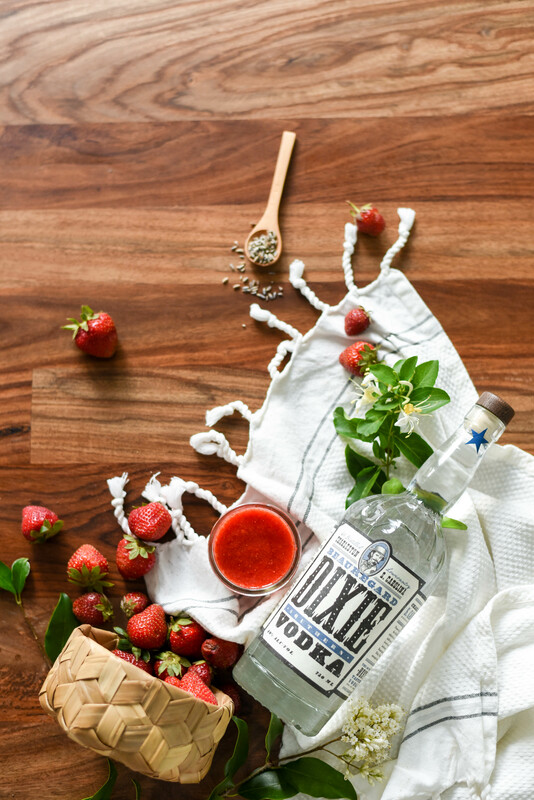 Muddled strawberries and garden mint meet lime juice and Dixie mint flavored vodka. It all gets topped off with club soda for a refreshing sparkler of a cocktail. Freeze-dried strawberries are the secret to a fun rim. You could swap out sugar for salt for a more savory rim if that suits you. In a bowl, sprinkle cut strawberries with sugar, let macerate for at least 5-10 minutes. 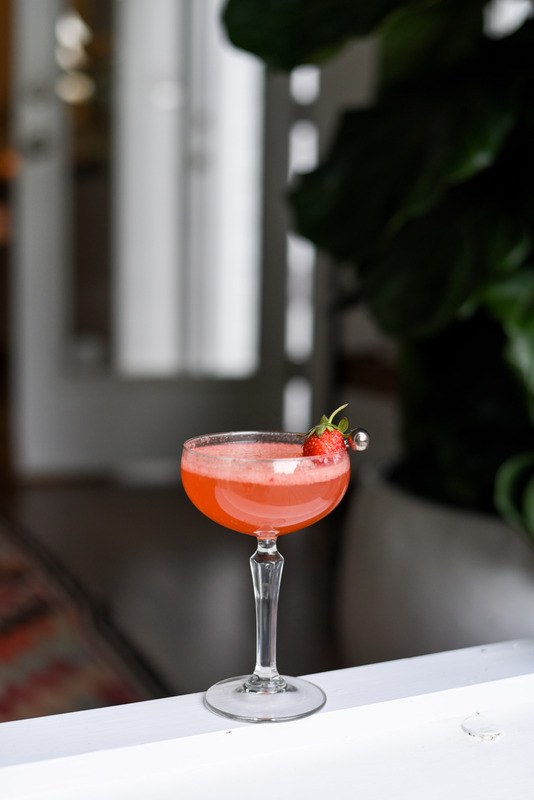 In a shaker, muddle macerated strawberries and lime juice until strawberries are completely smashed. Add mint leaves and muddle a few turns more. Add mint vodka and ice; shake well. Strain into a rimmed glass and top with club soda. Substitute sugar for macerating strawberries with agave or simple syrup to taste (no need to let sit, just muddle away!). Substitue mint flavored vodka for plain vodka, and double amount of fresh mint. 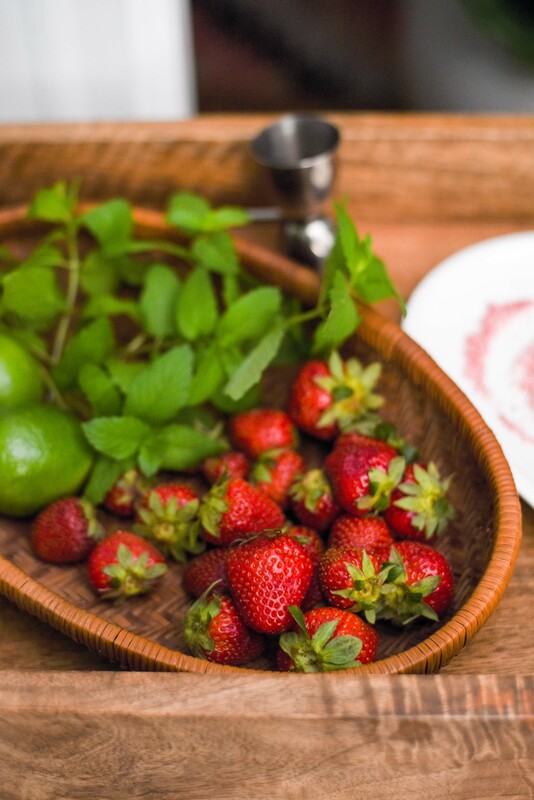 Pulverize freeze-dried strawberries with a mortar and pestle or in a food processor. Mix strawberry powder in equal parts with sugar and place on a small plate or shallow bowl. 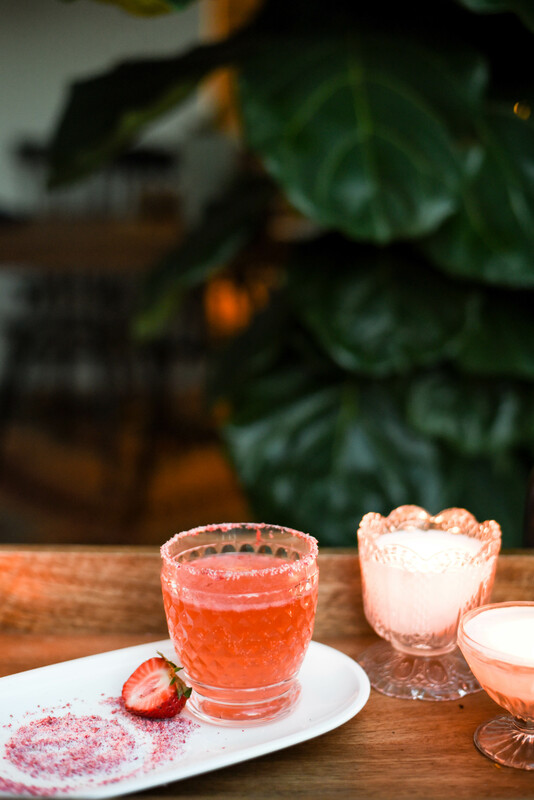 Wet rim of glass with a cut lime or cut strawberry, then dip into strawberry sugar. Next is a strawberry + lavender champagne cocktail spiked with vodka. Strawberries meet floral notes from lavender and Meyer lemon, then get sparkles from a topper of champagne. Head over to Lady Flashback to get the full recipe! 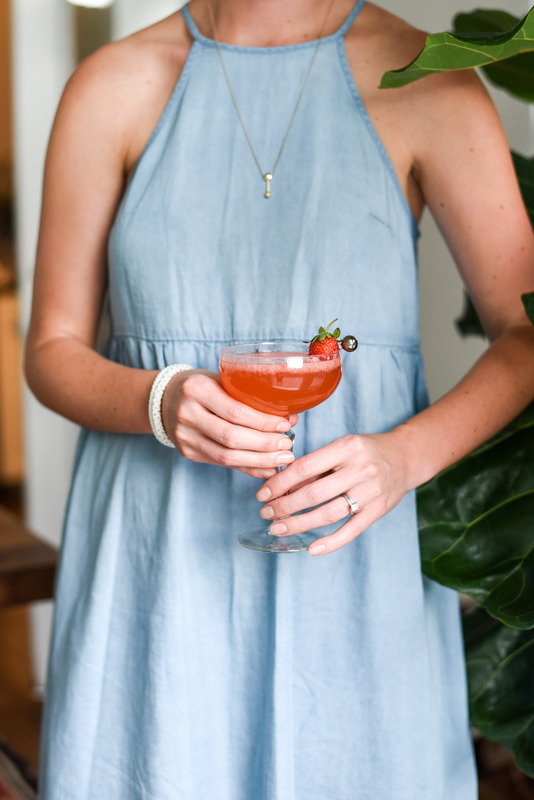 Cheers to all things strawberry, sparkling, and sweet!